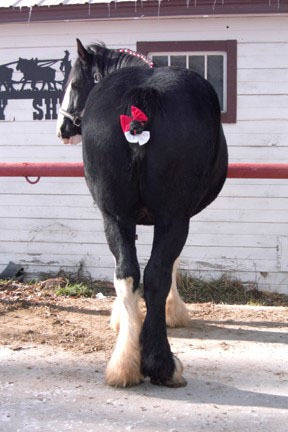 Lilly is a coal black registered Shire mare and the "grand lady" of our farm. 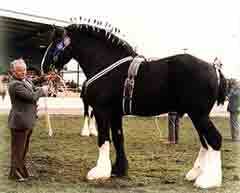 She is a granddaughter of the immortal Edingale Mascot one of the most renowned Shire stallions of our time. Mascot’s ability to reproduce himself in his offspring is well documented in Shire history. This is proven over and over by outstanding offspring such as the awesome Galway Warrior and our own Lilly. Despite being in her teens, Lilly is still an excellent example of the Shire breed. She is an impressive 17.3 hands tall and tips the scales at just under 2100 pounds. Her extraordinary conformation is perfect in every way. She possesses tremendous thickness, correct bone, thick feathering, and a very attractive, refined head. She is nicely spirited and has elegant, animated movement when in harness. Lilly has been a wonderful mother who consistently passed on her quality and conformation to her foals. As a broodmare she has produced several outstanding foals, and has been known to happily raise foals other than her own. Lilly has an excellent disposition. She is kind, quiet and easy to handle. She is broke to drive and has been used successfully in several places in a 6-horse hitch. The Shire breed is famous for its awesome size and strength and its extraordinarily powerful action. The Shire’s black color accented by white facial markings and white feather make them one of the most recognizable draft breeds. 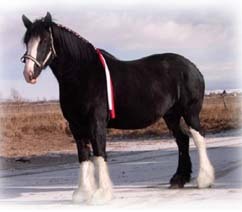 Not only is the Shire the largest draft breed in the United States, it possesses the most gentle nature. 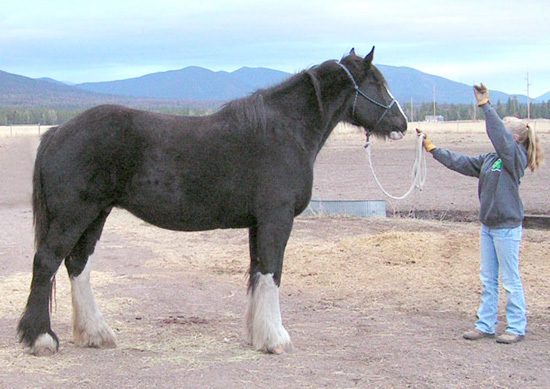 These traits have made the Shire one of the most sought after draft breeds for use in big show hitches as well as for sporthorse breeding.